I used to be just like you. I had a Downloads folder full of junk, and a desktop full of clutter. Screen shots, temp files, email attachments, and more filled my computer like leaves on the ground in autumn. Now and then I would try to clean up the mess, but it was a chore that all too often went undone. Then I made a DailyPurge folder, and my whole life changed. Now email attachments, screenshots, downloads, temp files, all that junk goes into a folder called "DailyPurge" in my home directory. And like magic (or having a competent night crew), every night the contents of that directory get moved into the trash, into a folder named with the date — for example, DailyPurge-2018-03-05. So my desktop stays clean, my DailyPurge folder stays clean, and on the rare occasion that I realize I actually want something that was in there, I can easily find it in the trash. You can enjoy this luxury too! It just requires creating a folder, two little text files, and then configuring stuff to use the new folder. 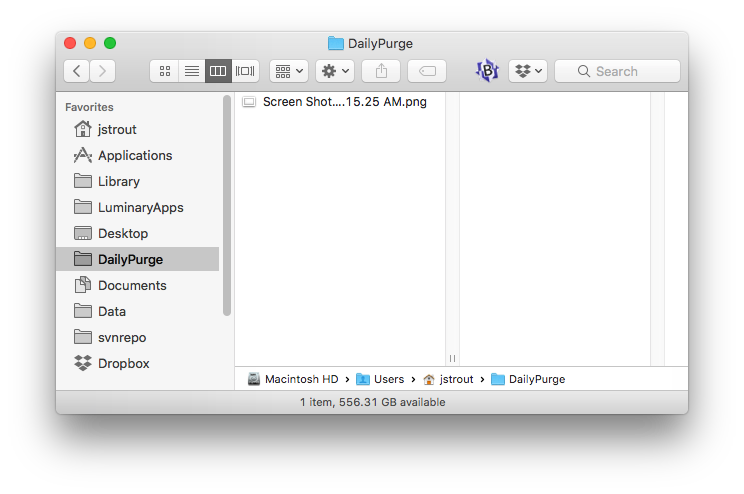 First, create a folder in your home directory called DailyPurge. This plist file should be pretty self-explanatory; it just specifies running a script called ".dailyJob" in your home folder, 3 minutes past midnight every day. Any normal output from that script is stored in ~/.dailyJob.log, and error output (if any) goes to ~/.dailyJob.err. Now you need to save this in ~/Library/LaunchAgents as a file called local.dailyjob.plist. The "Save As" option may not show you the Library folder, because Apple thinks you are likely to screw things up if you muck about there. In that case, just save the file to your Desktop, then in Finder, use the Go To Folder... command, and enter ~/Library/LaunchAgents. That will open the correct folder in the Finder; drag your plist in. echo "Moving to " $dest ":"
See here for more details if needed. Downloads: these are set in the preferences of your web browser; in Firefox, it's in the "General" section under "Files and Applications". Just click the "Choose" button, and select your DailyPurge folder. You'll find something similar in the prefs for Safari, Chrome, or whatever other browser you prefer. Attachments: Your email client will probably have a similar preference setting somewhere for a folder to use when you double-click an attachment to view it (especially if it's a compressed attachment). Let it save or unpack it into DailyPurge, so you don't have to worry about cleaning up after it. Others: as you go about your daily Mac life, you'll run into other situations where you need to save some temp file — for example, printing a document to PDF just so you can send it as an email attachment. Save it to the DailyPurge folder, and then forget about it. Pro Tip: drag the DailyPurge folder into your Favorites on the left side of any Finder window, and then it'll be easily accessible not only in the Finder, but also in any file (open/save) dialog. So that's it! Make yourself a DailyPurge folder, and set up the script to ensure it gets purged daily. Life is good!